The Rubicon programme gives young, highly promising researchers the opportunity to gain international research experience. Thanks to a Rubicon grant from NWO, seventeen researchers who have recently received their PhD degree can continue their research at foreign research institutes. One of them is our alumnus Luuk Loeff. 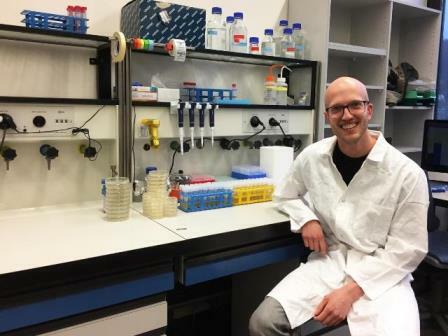 Loeff found a place in the laboratory of Martin Jinek at the University of Zurich (UZH). Jinek became well-known through his work at the lab of Jennifer Doudna (USA), one of the discoverers of the CRISPR-Cas system that enables researchers to make highly precise modifications of cells. UZH is thus an attractive place for a biochemist who has thrown himself into CRISPR. Seventeen young doctors received a Rubicon to go abroad. This is often an important step in their careers, says an NWO research funder. Loeff was the only recipient from TU Delft. In total there were 81 applications, 21% of which were honoured. Every year, NWO supports about 60 young researchers in three rounds to an amount of EUR 7 million. Bacterial immune systems contain useful functions, such as the cutting of DNA, which can be used for clinical and biotechnological applications. The researcher will characterise the molecular mechanisms of new immune systems and uncover possible commercial applications of these proteins.